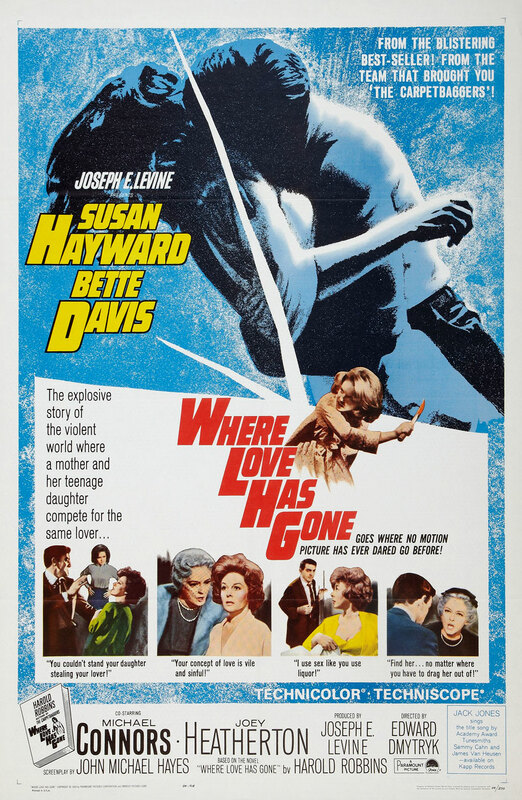 Put Susan Hayward and Bette Davis together and what more could you ask for than the spectacular, wacky trash that is 1964’s Where Love Has Gone — a pot-stirring film adaptation of the Harold Robbins novel, loosely based on the infamous Lana Turner / Johnny Stompanato case affair from the late fifties. A quick glance at the poster design tells you almost everything you need to know: there’s a lot going on and it’s all over the top — this is the Sirkian soaper of the fifties on steroids. Hayward is at her best here: playing a San Francisco society girl with a classy veneer and mean streak — one that most often manifests itself in rather outrageous outbursts of infidelity. And in typical Hayward style, she’s self-righteous about all of her flaws — and no other actress (save possibly Davis herself, and maybe Elizabeth Taylor) could flavor her imperfections with such deliciously entertaining venom. In addition to her blue blood, Hayward’s Valerie Hayden-Miller is also a sculptor of some notoriety. In one of the film’s many flashbacks, the story wades into the shallow pool of cliché in order to bring together Valerie and her future husband, war hero Luke Miller (Mike Connors). He’s back in the States (to receive the Medal of Honor, of course) for his exploits in the Pacific; and while taking in some culture he finds himself circling a sculpture at a posh Nob Hill art opening. He unwittingly tees off on the superficiality of the work and the ostentatious venue to the nearest bystander, who just so happens to be Valerie, the artist herself (of course) — happily at home in the upper crust. It’s a tired device we’ve seen in a thousand other films, but it serves well here to introduce our future husband and wife, and fundamentally outline their soon-to-be irreconcilable differences. Before we know it they are wed, but with the war far from over Valerie has to slog out the early days of their marriage on the home front. We get some early insight into her character when one pal after another questions her ability to remain faithful while Mike is away island-hopping towards Japan. She manages to remain faithful, and life really begins for the Millers in those hedonistic days of 1945 following the Japanese surrender. Yet while she is productive in her studio, Luke fails to find work as an architect on his own merits. Soon he is obliged to take a job proffered up by Valerie’s overbearing mother (Bette Davis — dig all that makeup!) in the Hayden family firm (they already live in a swanky house, again proffered up by said mother-in-law). As soon as Valerie becomes pregnant, the marriage begins to flounder. He starts drinking and she starts fooling around. By the time little Danielle enters the world he’s guzzling straight from the bottle and she’s making like the village bicycle. They quickly divorce, and Dani grows up not knowing her father, until that fateful day years later when he’s called away from a business meeting to find out that she, now a teenager (Joey Heatherton), has killed a man. And not just any man — her wanton mother’s latest lover! The best thing about Where Love Has Gone is that it catapults toward excess in a way that few early sixties films even attempted. It’s sublimely trashy, and brought to life by a trio of women perfectly suited to make such a film utterly captivating. Not surprisingly, Heatherton draws the short straw here. She had been much, much better the year before as Nick Adams’s wife-prostitute in Twilight of Honor, but there she had been essentially the only woman in an almost all-male cast (riffing on Lee remick in Anatomy of a Murder). Here she gets swept away by the hurricane otherwise known as Susan Hayward. It’s decisively Hayward’s picture, and she’s comfortably inside her wheelhouse. Even Bette Davis stays out of her way. Davis’s performance is at times shallow: she defers to Hayward is their scenes together, almost convincing you that she’s just going through the motions in order to cash a check, until she gets screen time opposite Mike Connors, when she’s able to drop the shrill exterior and make us remember her extraordinary emotional range. In the end, Where Love Has Gone isn’t a film that asks you to think, and that’s perfectly fine. Instead it’s garish nonsense, as loud and smelly as a passing city bus plastered with gaudy advertisements and unreadable graffiti — to be gaped at as is splashes up a street of countless potholes — get on board for a little while. Some of those potholes are patched with cliché, but most are simply ignored. Get off if you like, but Susan Hayward is there whispering (no, shouting) in your ear to stay on for one more stop and see what happens. And why not? You bought the ticket, ride it to the end of the line. Never saw the movie, but I love the review, especially the last paragraph. So good.